The Hollywood Vampires are a supergroup project featuring Alice Cooper, Aerosmith’s Joe Perry and Hollywood A-list star Johnny Depp as the core members. The original “Hollywood Vampires” were a group of drinking buddies in the 1970s that included Cooper, Elton John collaborator Bernie Taupin, former Beatles John Lennon & Ringo Star, The Who’s Keith Moon, The Monkees’ Mickey Dolenz and singer/songwriter Harry Nilsson. This album was put together as a tribute to the the spirit of that original band of brothers, except this time without the alcohol. The track list features a variety of songs from the ’60s and ’70s. Tracks by The Who, Led Zeppelin, Badfinger, The Doors, Harry Nilsson, T. Rex, Plastic Ono Band, Alice Cooper, Pink Floyd, Spirit, Jimi Hendrix, Small Faces are represented here along with two original tracks: “Raise the Dead” and “My Dead Drunk Friends”. There is also a spoken word intro my horror movie legend Christopher Lee. Hollywood Vampires is a very cool album and while I may not be familiar (or even a fan of) some of the music choices, I can’t deny that it’s fun and great hearing an album featuring the likes of Alice Cooper, Brian Johnson, Slash, Joe Perry, Kip Winger, Paul McCartney, members of the original Alice Cooper band, Dave Grohl, etc. playing together. Obviously with a cast this big you can’t take everyone out on tour. For the live dates, the group consists of Alice Cooper, Joe Perry, Johnny Depp, Tommy Henriksen, Bruce Witkin and former GNR members Duff McKagan and Matt Sorum. 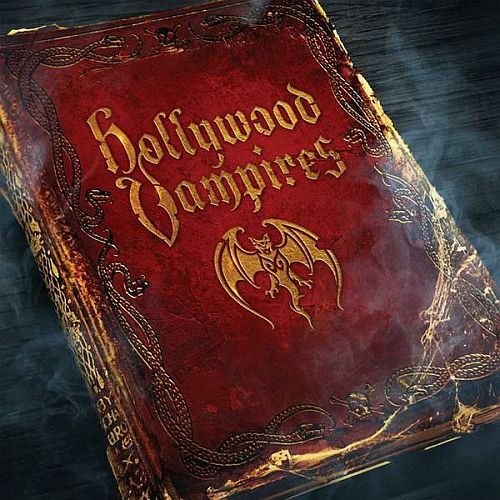 This is a fun effort and hopefully the Hollywood Vampires will release more albums like this in the future. I wonder though, Alice had been working on a cover album for a few years and I haven’t heard much about that lately. Could it be his album of covers morphed into this project?